South End Press, 9780896087644, 317pp. Adoption: Who profits? Who pays? Who makes the rules? What does it have to do with war? 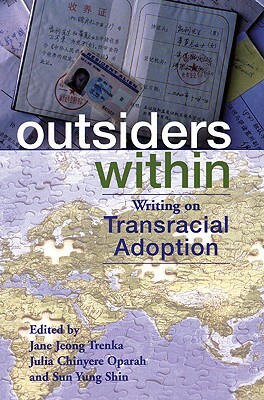 Jane Jeong Trenka, born in Seoul, Korea, was adopted into a white family in rural Minnesota in 1972. She was reunited with her birth family in 1995. Her book, The Language of Blood, received the Minnesota Book Award for Autobiography/Memoir and was a Barnes & Noble Discover Great New Writers Selection. Trenka has received many literary fellowships and commendations. Sun Yung Shin is a poet, essayist, journalist, and writing teacher who has won literary fellowships from the Jerome Foundation, the Minnesota State Arts Board, and the Loft Literary Center. Adopted from Seoul, Korea in 1974 into a white family, currently Shin lives in Minneapolis with her husband (a domestic kept-in-the-family adoptee from Chicago) and their two children.